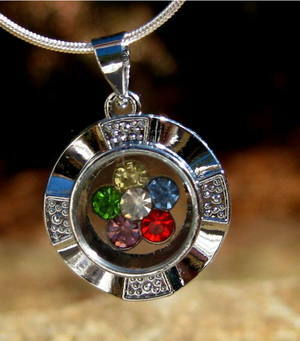 I am so honored to�offer these lovely pendants, each with 6 baby Fairies attached! �They are�active, playful and very happy. She will bring unlimited blessings and joy to your life the moment you receive this gorgeous pendant! These babies have beautiful singing voices and will enchant you with their soothing lullabys. Each tiny fairy is unique in appearance and mannerisms but each bring a beautiful gift of light! I do not often sell fairies, but these were simply too special to ignore. They were�presented to me by a dear friend who specializes in Fae. �Agnes is 85 years old and her home is devoted to the Fairies. Visiting her home is like walking into Spring! It smells�like fresh flowers�and the atmosphere is warm, nurturing and inviting. As we sipped tea, the tiny fairies buzzed around the table. I have never seen so many fairies in my life! It was truly a wonderful and unforgettable experience. After tea we walked in her garden. It is full of lush and exotic plants and of course....MORE FAIRIES! �I learned so much in the afternoon that I spent with Agnes and I developed a deep appreciation for Fairies that I didn't have prior to this special visit. I had always loved them, but did not know how adorable, sweet and�giving they really could be. The Magickal Baby Fairy pendant is beautiful!� It has a multi colored flower inside that spins!� It comes with a cleansing chain. Law requirement states that readings, spells, and paranormal objects are for entertainment purposes only and that I cannot take any responsibility for any activity that may or may not occur in association with this item. You must be 18 years of age to bid on this item!! Paypal or money order only. Payment due within 5 days of auction end. Insurance is included in shipping charge.